Welcome to the greatest gun show on the planet! With over 1,600 exhibitors, it’s the place to be for any serious gun, ammunition and tactical enthusiast. This week, the Sands Expo Center in Las Vegas, NV will host more than 64,000 visitors both national and international, as they come face-to-face with the best the industry has to offer. NSSF (National Shooting Sports Foundation) has gathered, organized, and highlighted the newest and most innovative products. 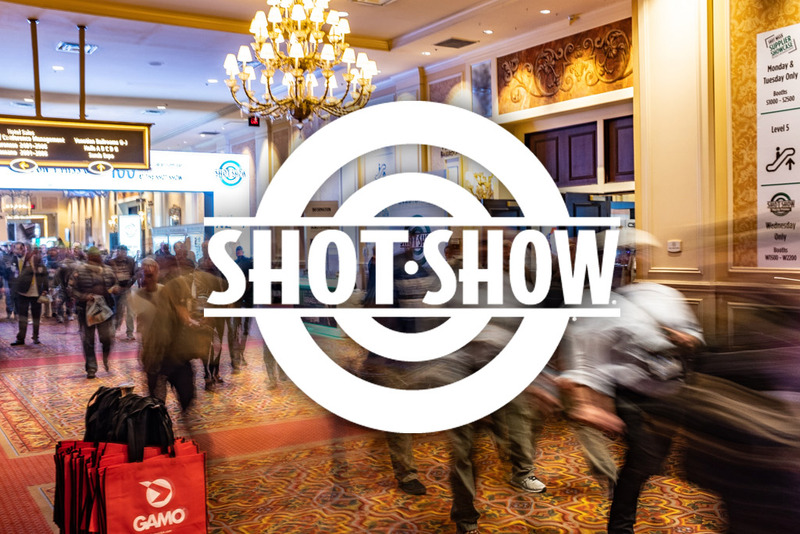 SHOT show attendees can use a handy app to zero in on which exhibitors they want to visit and demonstrations they want to see. The SHOT show app will literally allow you to map your route and experience in the trade show. 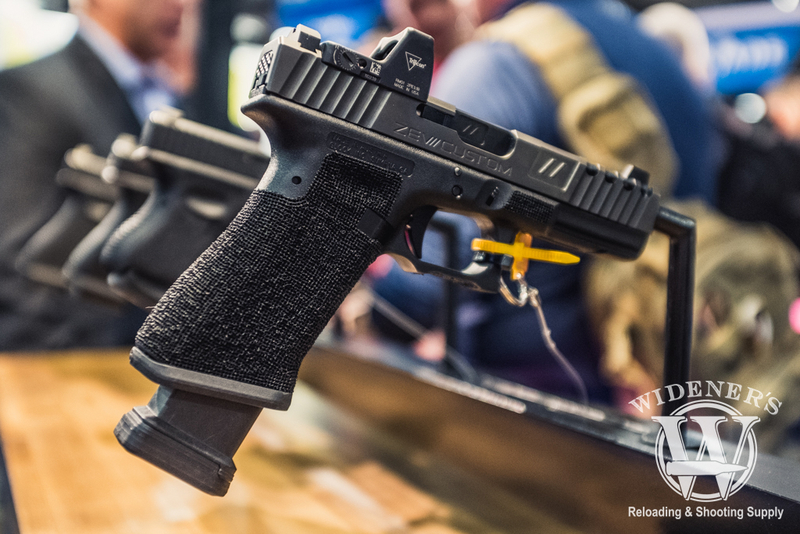 Let’s dive in and take a look at some of the hottest new items at SHOT Show 2019. 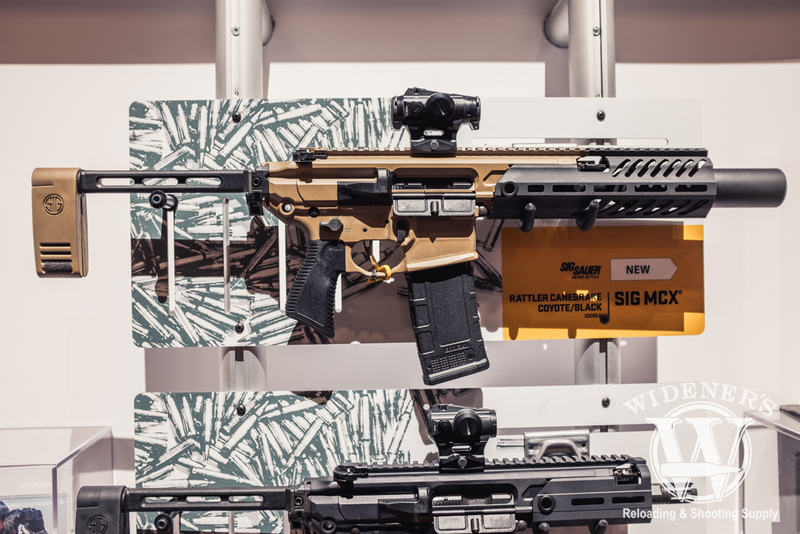 Magpul celebrated their 20th-anniversary with the crowd at their booth at SHOT show 2019. Special anniversary edition stickers, gold-sparkle Magpuls, and other swag were passed out to show attendees as fast as the Magpul staff could hand them out. 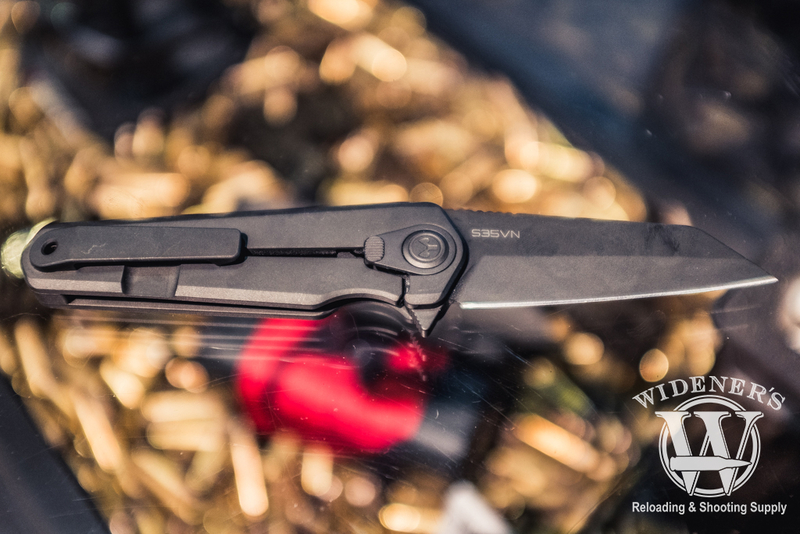 Magpul announced a new line of eye-pro wear a well as a new knife, the Rigger, a limited edition frame lock with a Wharncliffe blade. The Magpul Rigger knife is a limited run of short, serialized production knives available in the Spring of 2019. Magpul continues to grow their popular PMAG line with the addition of the rugged D50 & D60 drum magazines. The PMAG D50 holds 60 rounds of 5.56 NATO for AR/M4 platform rifles, the MSRP is $129.95. The PMAG D60 holds 50 rounds of .308/7.62×51 NATO for SR25/M110 platform rifles, the MSRP is $149.95. 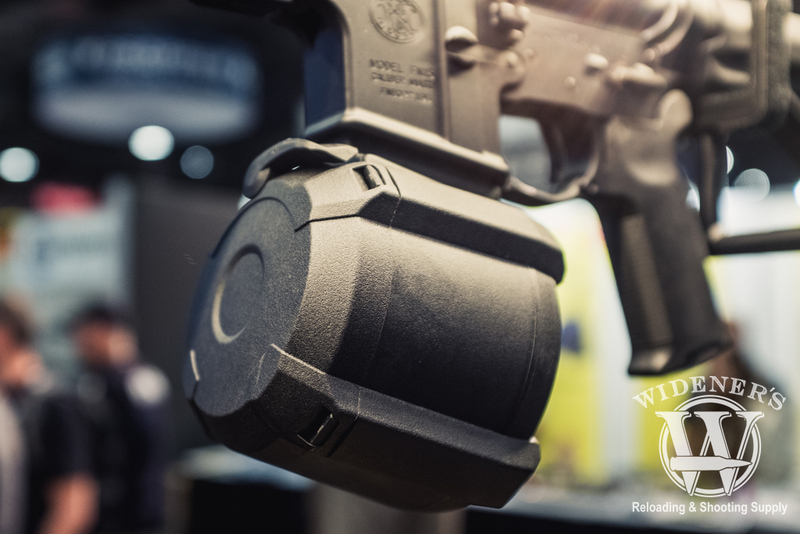 The Magpul PMAG D50 & D60 display at SHOT show 2019. The rugged Magpul PMAG D60 for 5.56 NATO AR/M4 platform rifles has a 60-round capacity. The new Magpul PMAG D50 for 7.62X51/.308 NATO for SR25/M110 platform rifles has a 50-round capacity. The Magpul GL Enhanced Magazine Well attachments work with the Gen 3 & 4 models of the Glock 17 and Glock 19 Pistols. The large ramp makes for fast, easy magazine loading, the edges are rounded to avoid any snagging or excess printing when carrying concealed. 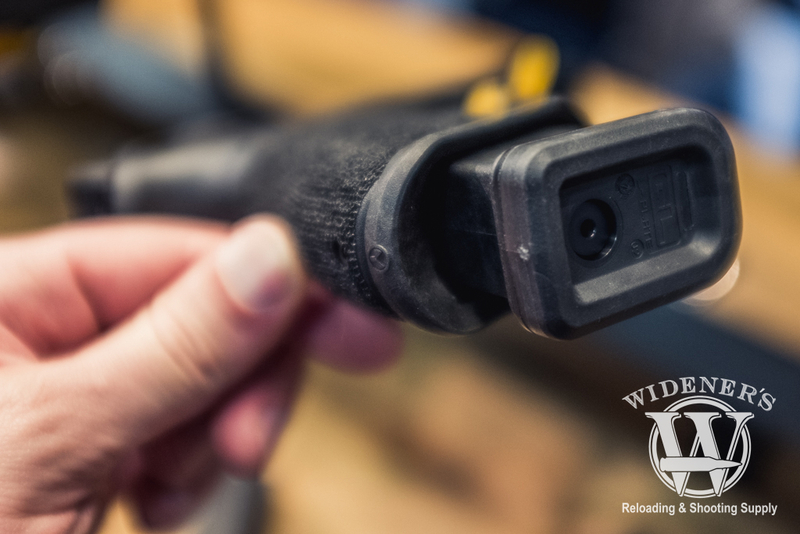 The magazine wells are compatible with Magpul and OEM magazines, the Magpul magazines available at the booth were very smooth in operation with the GL enhancement. A side profile view of the Magpul GL Enhanced Magazine Well on the Glock 17 pistol. A close-up view of the Magpul GL Enhanced Magazine Well for the Glock 17 & 19 pistols. Following up on our blog post about the new GLOCK G48 and G43X pistols in 9×19, I got to handle them in person at SHOT Show. The finish on the slides is a metallic satin, the two-tone appearance stands out from the rest of the Glock lineup. The G48 is everything you love about the G19 in a slimmed-down package, the G43X makes an excellent upgrade or addition for G43 owners who EDC. The MSRP on the G43X and G48 models is $580. 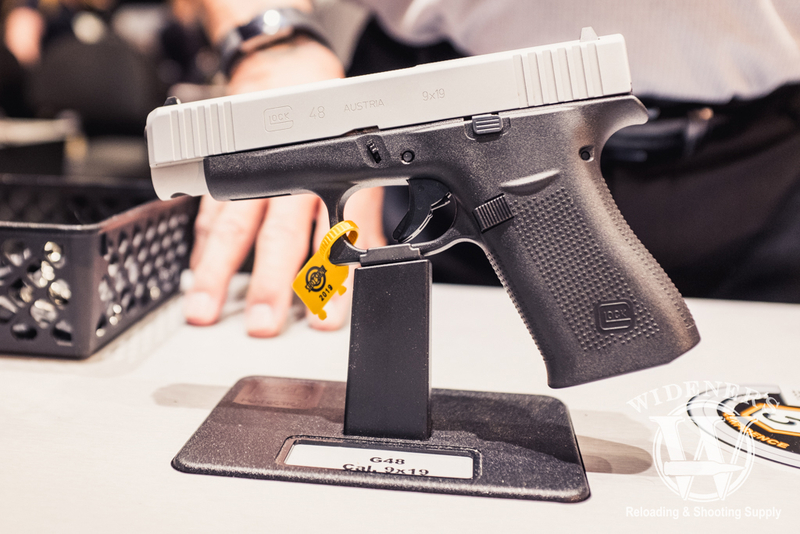 The new Glock G48 on display at the Glock booth at SHOT Show 2019. 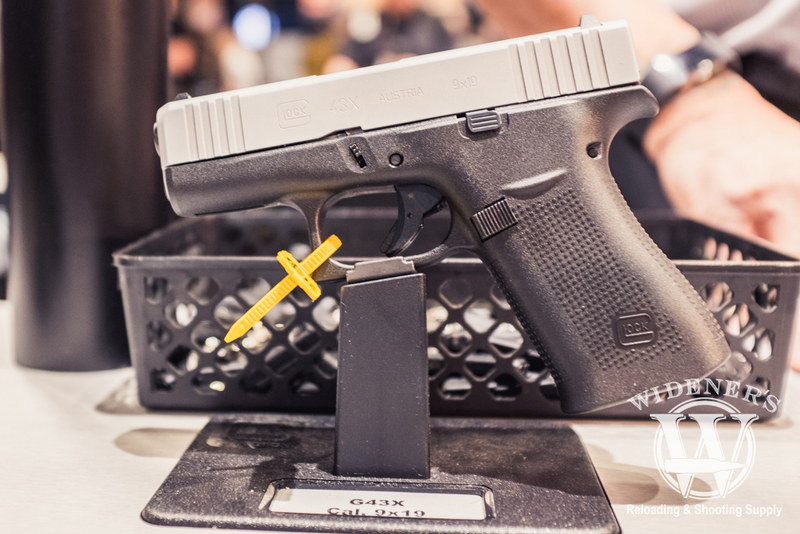 The new Glock G43X on display at the Glock booth at SHOT Show 2019. The slide on the new G48 pistol is identical in length to the much loved G19 model. 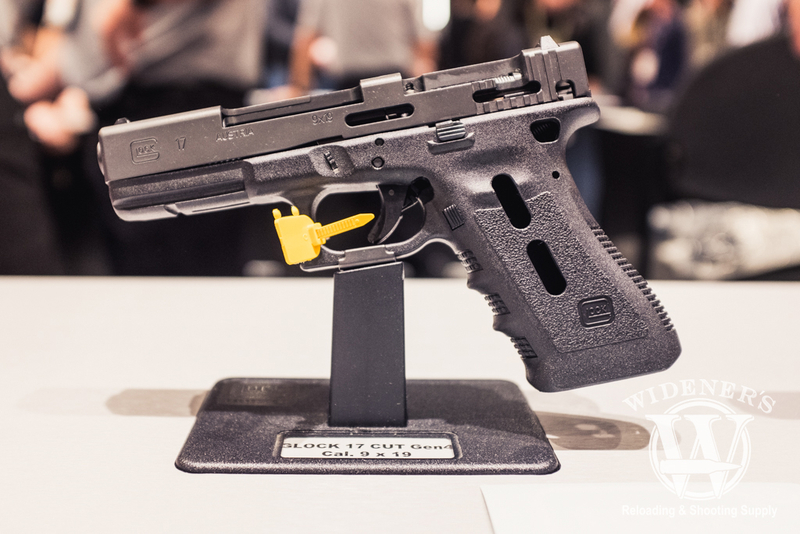 A cutaway version of the Glock 17 Gen 4 on display at the Glock booth. Speaking of the new Glock G43X and G48 pistols, DeSantis already has a new lineup of quality Gunhide holsters in a variety of styles for the new pistols. 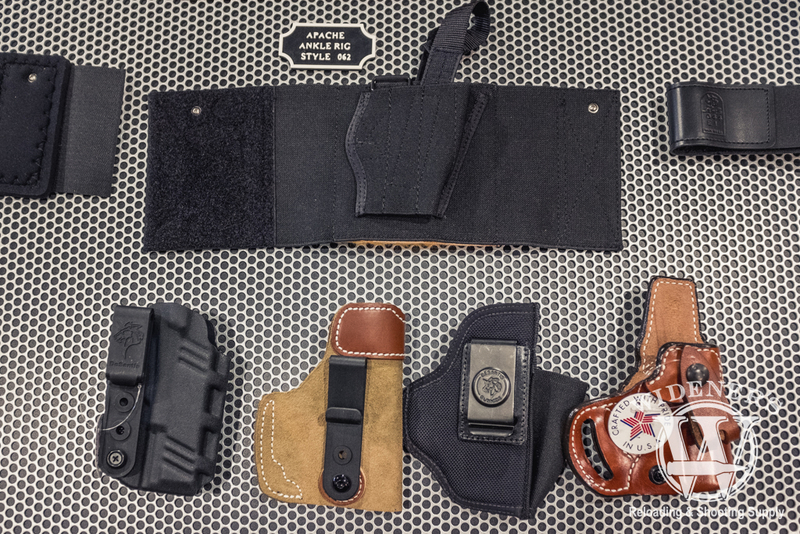 Whether you prefer an in-waistband solution, the classic hip-carry, or an ankle holster backup, DeSantis has the right holster for your style of carry. The DeSantis line of carry options for the Glock G43X and G48 pistols. Federal Ammunition announced the availability of 25 new products at SHOT show 2019. Highlights of their expanded line of popular products include: HST 10MM AUTO, HYDRA-SHOK DEEP in 40 S&W and .45 Auto, BARNES TSX Triple-Shock in 17 loads from 223 Rem. to 300 Win. Magnum, BERGER HYBRID HUNTER in 10 calibers from 243 Win. to 300 WSM, EDGE TLR in 6.5 Creedmoor, GOLD MEDAL SIERRA MATCHKING in 6mm Creedmoor and GOLD MEDAL BERGER in 224 Valkyrie, 300 Win Mag. 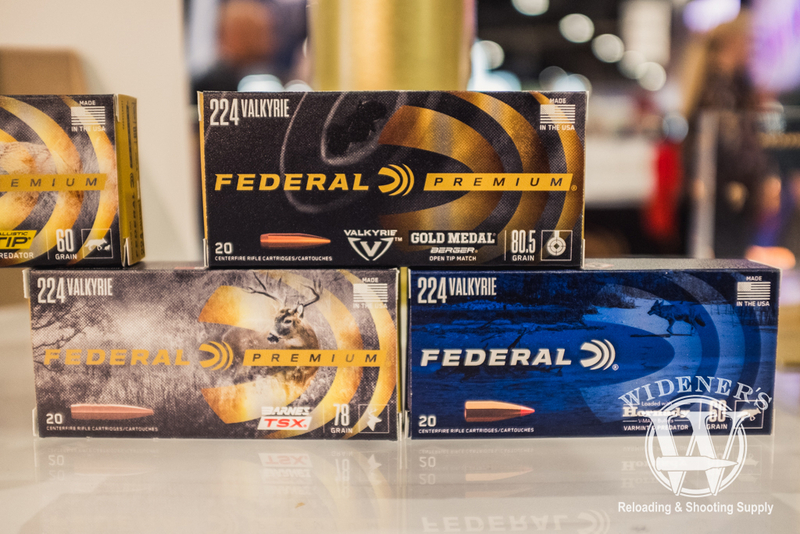 The Federal 224 Valkyrie is now available in the Gold Medal Serria Matchking line. 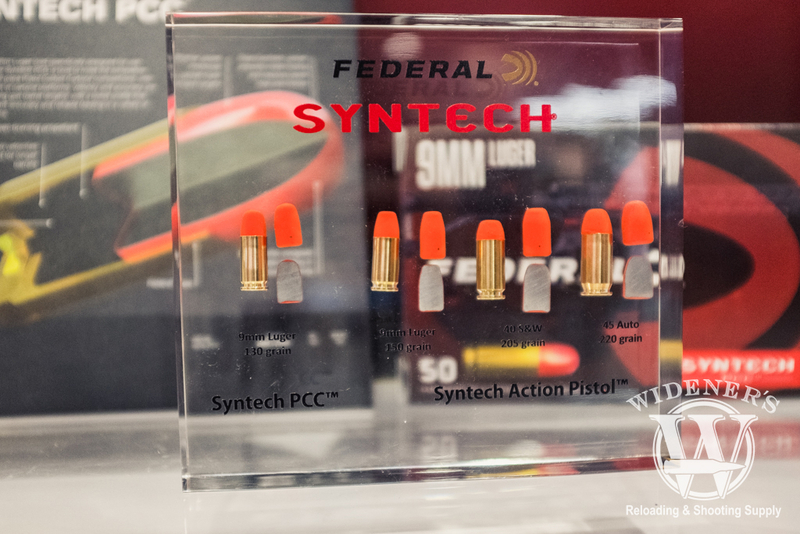 The non-toxic SYNTECH line of products also added several new options including the exciting new SYNTECH DEFENSE line of Hollow-point bullets, on impact, each round separates into three segments with a deep-penetrating core. The new defense round has 12-18″ inch penetration depths in ballistic gelatin and is available in 9mm Luger, 40 S&W and 45 Auto. Also added to the SYNTECH lineup are the SYNTECH PCC 9mm Luger loads for carbine length barrels, which will be a popular option for PCC competition sports shooters. 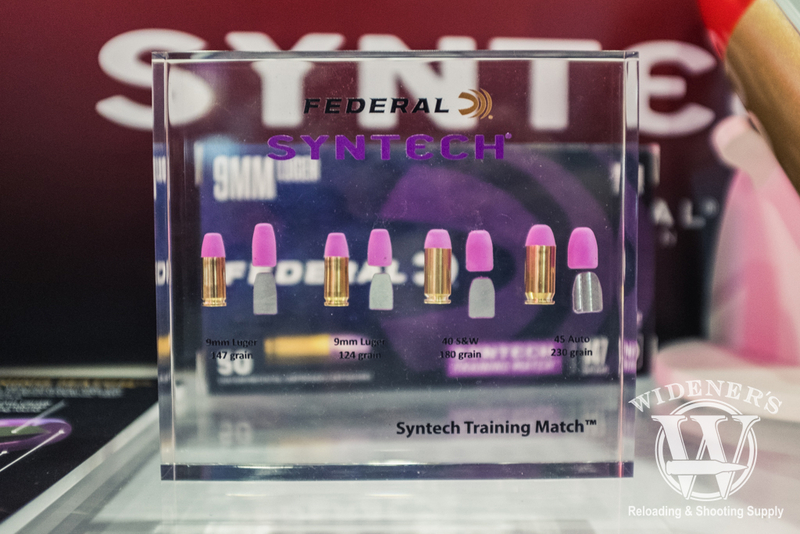 The Syntech Training Match ammunition is available in 9mm Luger, 40 S&W and 45 Auto. Syntech PCC is available in 9mm, Syntech Action Pistol is available in 9mm Luger, 40 S&W and 45 Auto. Also new to the Federal lineup is the Shorty Shotshell, this 1-3/4″ shell may look tiny, but it packs a 12 Gauge punch with performance similar to its full-size counterparts. Look for it on the market soon in Rifled Slug, #4 Buck and #8 shot options. 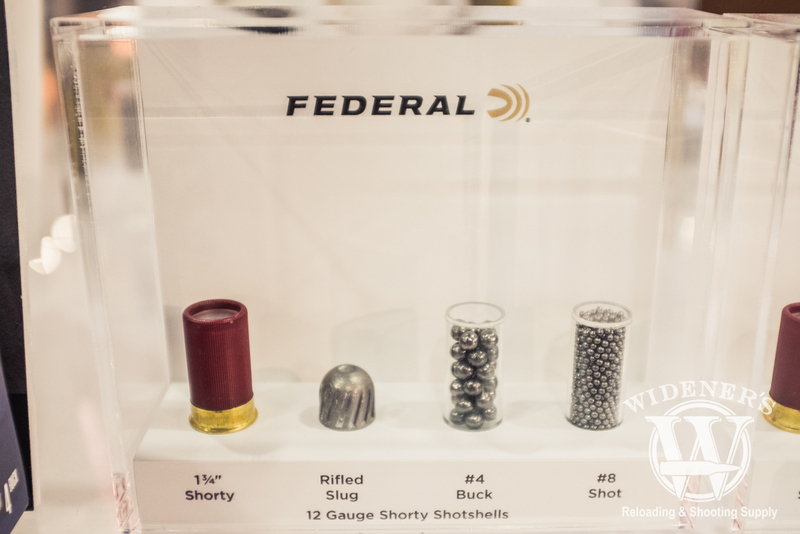 The new Federal Shorty Shotshell is a true 12 Gauge load that means business. 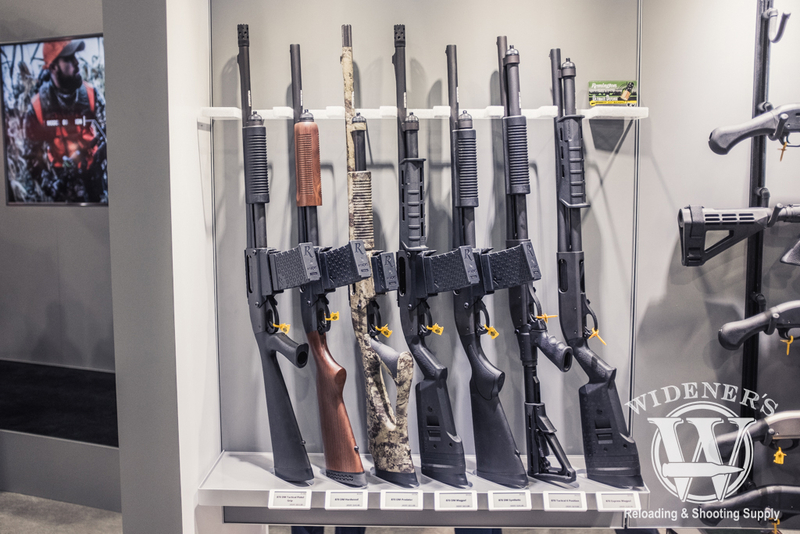 The Remington booth included the full lineup of 870 models in tactical and hunting variations, as well as the Tac-14 in a variety of different need-specific configurations. The Tac-13 V3 12 Gauge on display features a patented Versaport gas system that offers manageable recoil in a compact 26.5″ package. The MSRP on the Tack-13 V3 is $915. 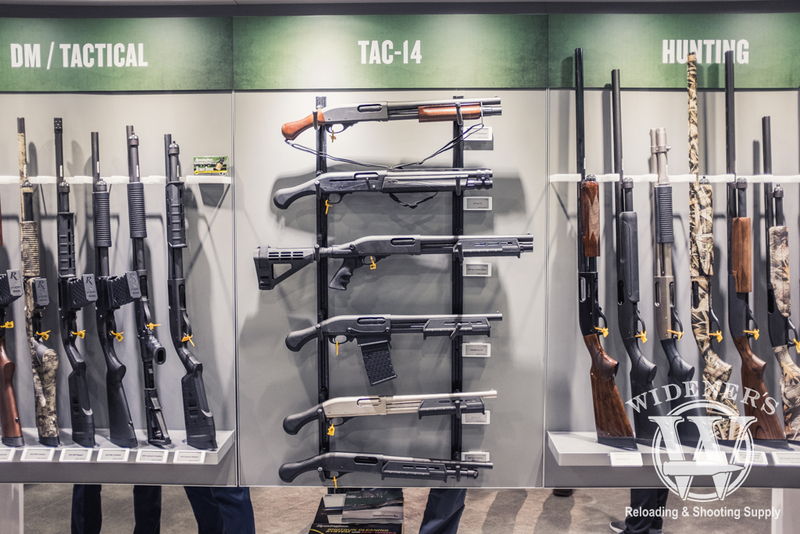 The Remington 870 and Tac-14 shotgun lineup at SHOT Show 2019. The Remington 870 lineup included the 870 DM Magpul which features a detachable 6-round magazine and Magpul furniture. The 870 DM Magpul has an 18.5″ barrel with tactical Rem choke, it is advertised as being the fastest loading pump shotgun ever made. MSRP on the 870 DM Magpul is $799. The Remington model 870 12-gauge shotgun is still as popular as ever. Remington also displayed their line of subsonic ammunition at SHOT Show, showing off their subsonic 9mm and subsonic .45 ACP rounds in their booth. The Remington subsonic 9mm is a 147gr MC bullet, the subsonic .45 ACP is a 230gr JHP bullet, both options are a particularly good choice for suppressed handguns. 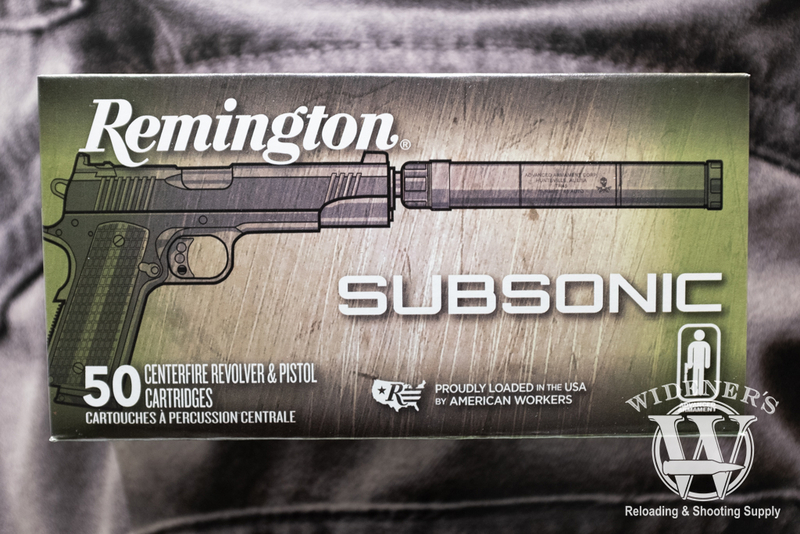 Remington’s subsonic ammo is a great choice for suppressed handguns. The Remington Model 700-CP was also on display at their booth, this bolt action handgun is available in .223, 300 Blk or .308 Win with a 10-round magazine. 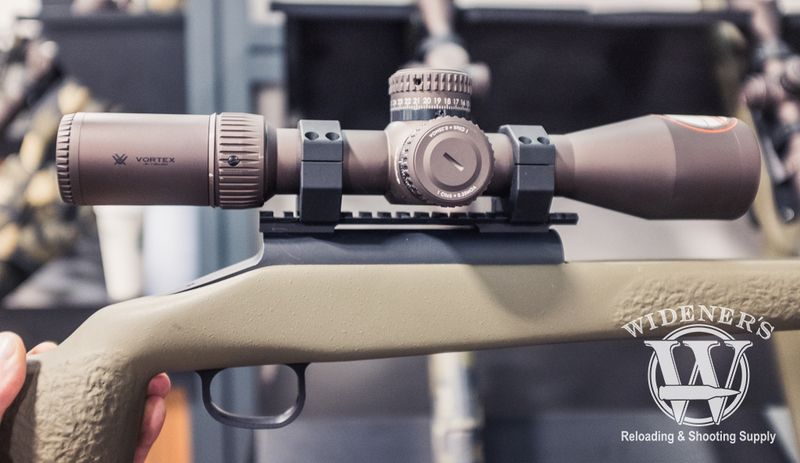 The 700-CP model has the new Remington 700 Chassis system that allows the handgun to fire accurate, flat-pathed trajectories for long range, hunting, or range shooting. The MSRP on the Model 700-CP is $1020. The Remington 700-CP may look like an odd duck, but it’s a surprisingly well-balanced bolt action handgun that’s worth a second look. 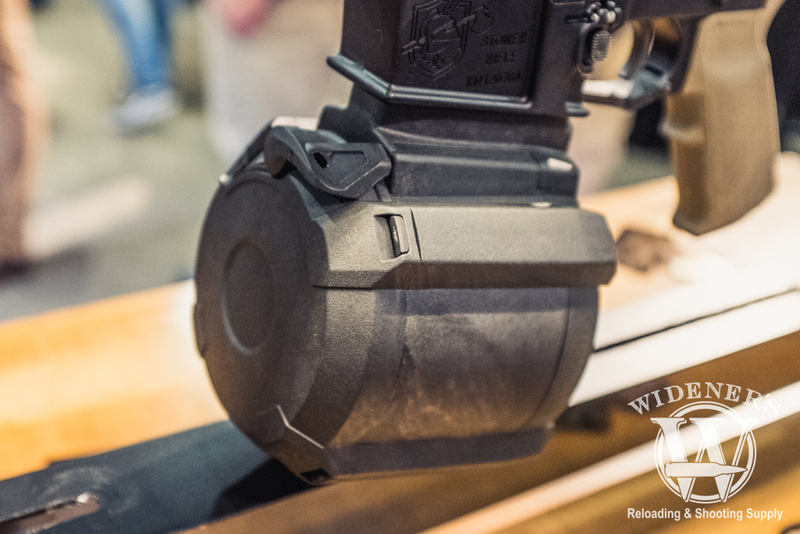 Winchester introduced the world to the 350 Legend at SHOT show 2019. The 350 Legend is a high-performing straight-walled cartridge designed for hunters and sports shooters who value excellence in performance. 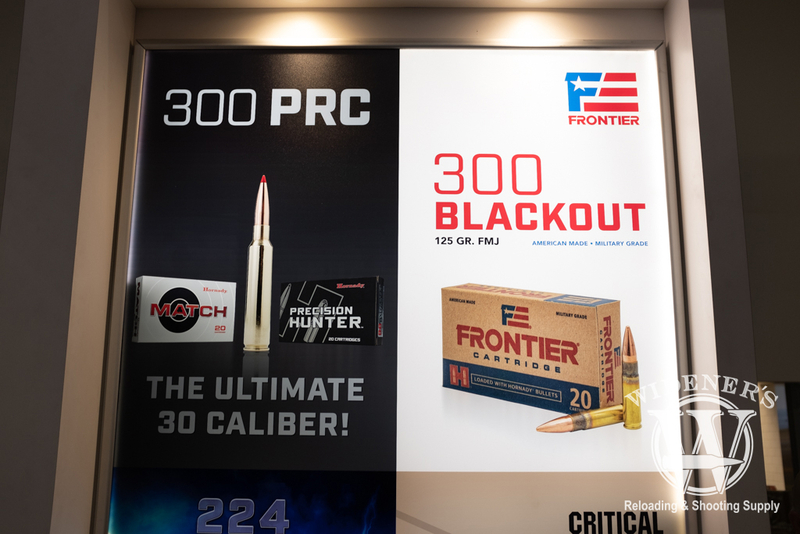 The polymer-tipped cartridge debuted to fanfare and positive media reviews at the show, it’s ballistic profile and .357 inch diameter already have a fan following in the hunting community. Winchester’s surprisingly budget-friendly line of XPR bolt-action rifles are the only guns currently chambered in 350 Legend, however, there are plans to add new models to support the cartridge in the near future. Straight up legendary. The new 350 Legend cartridge from Winchester turned heads at SHOT show 2018. 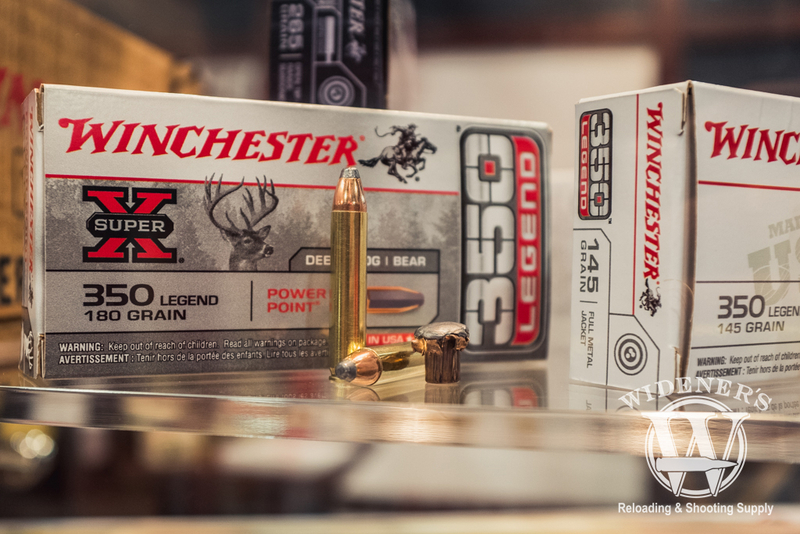 The 350 Legend Super X 180gr Power Point from Winchester is designed for deer, hog and bear hunting. 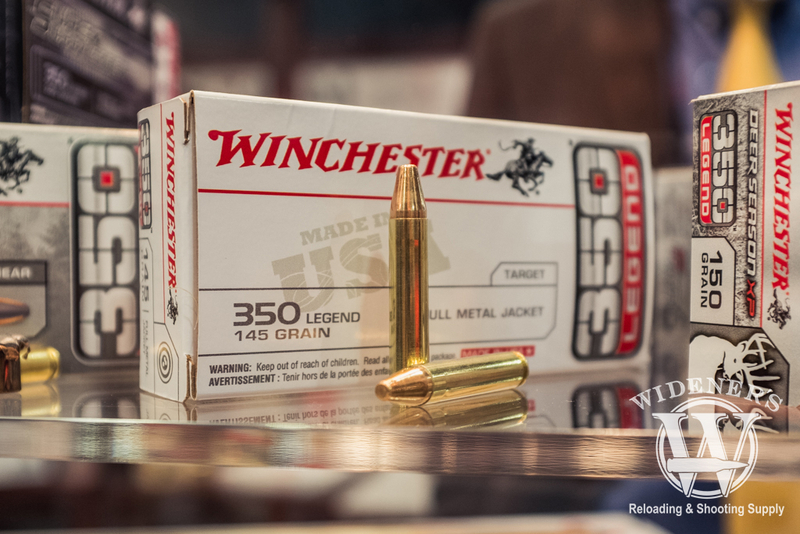 The Winchester 350 Legend 145gr FMJ bullet is a great option for target shooters. 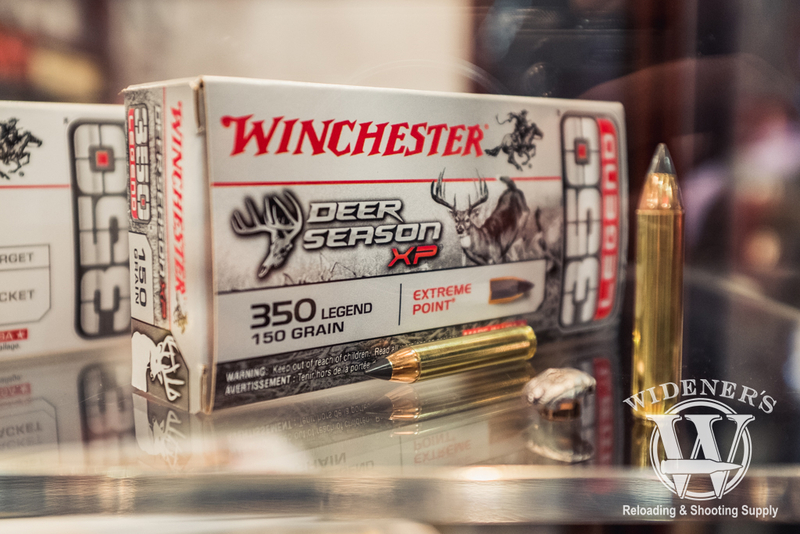 Winchester’s Deer Season XP 350 Legend 150gr bullet is built for one task, taking down deer with a single shot. 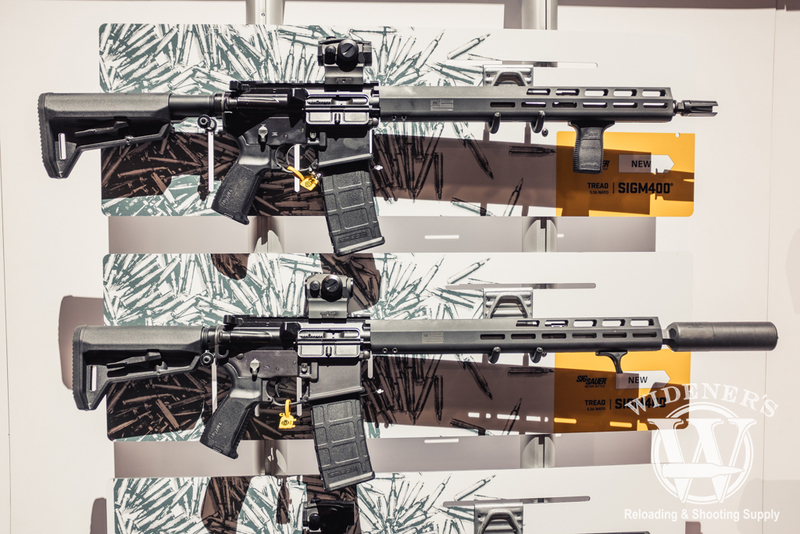 The Sig Sauer booth at SHOT show 2019 was full of new products with swarms of attendees and media personalities pawing over and discussing the new firearms. 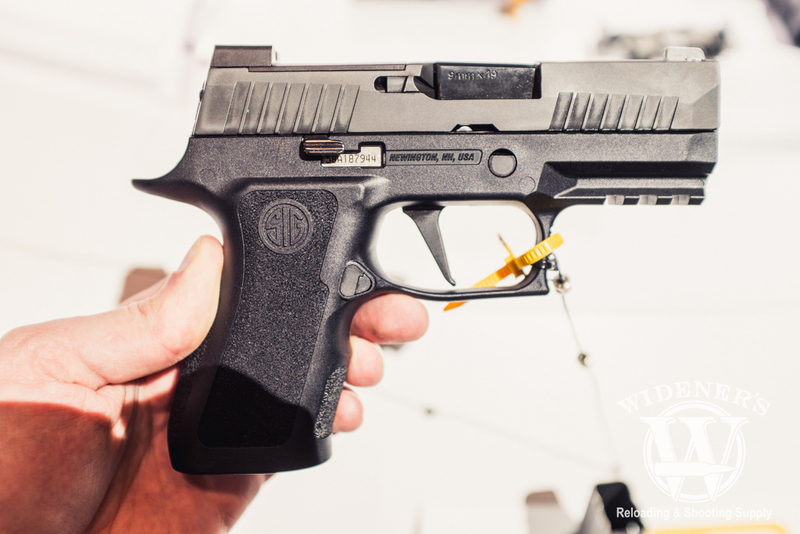 Sig has it’s sights set on increasing its presence in the personal-defense handgun world and introduced six new models with that goal in mind. New models for 2019 include the P229 Legion SAO, P365 Manual Safety, P320 XCOMPACT, MCX Rattler 5.56 NATO, MCX Rattler Canebrake 300 BLK, and the MPX Copperhead. 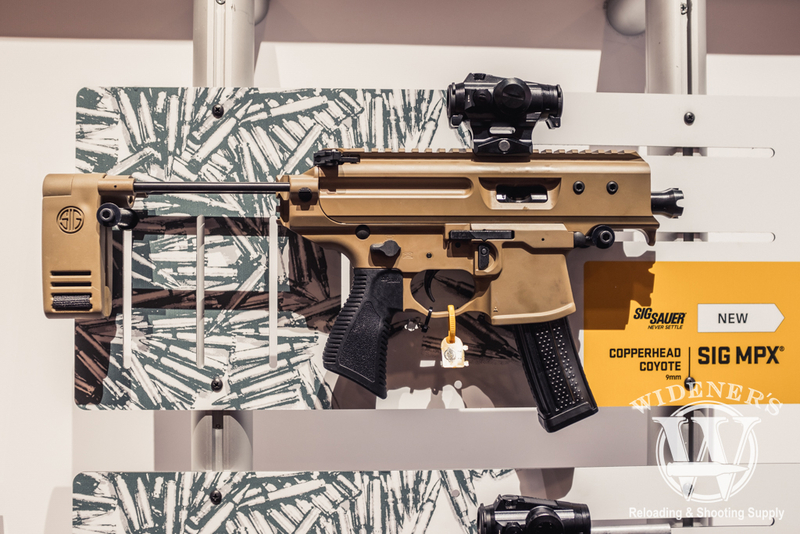 The Sig MPX Copperhead Coyote is chambered in 9mm, takes 30-round mags and has an MSRP of $1835. The Sig MCX Rattler Canebreak is chambered in 300 BLK, holds 30-round mags and is built to run as a suppressed system. 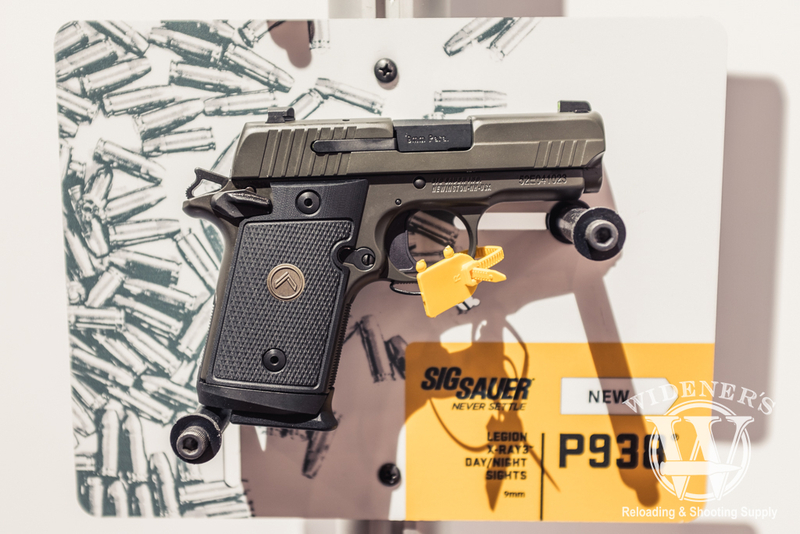 The Sig P938 Legion is a micro-compact chambered in 9mm, it holds 7+1 and has an MSRP of $904. 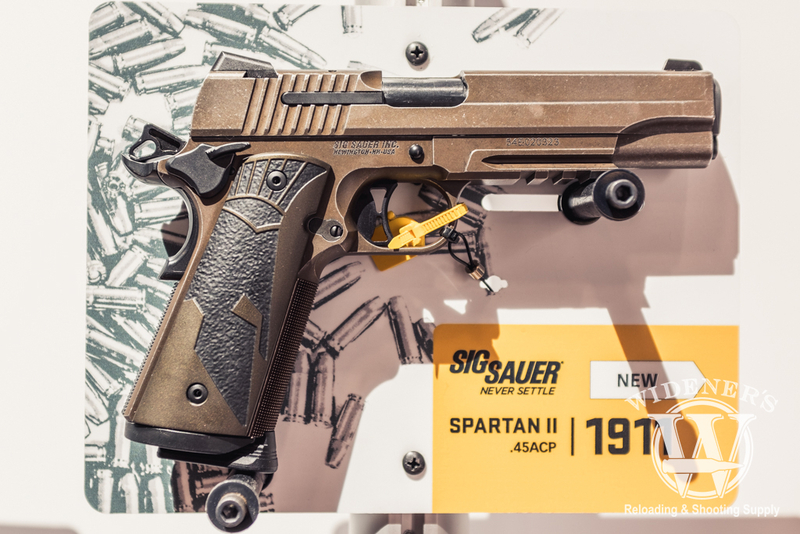 The Sig Spartan II is chambered in .45 ACP, features a new Coyote PVD finish and has an MSRP of $1397. The Sig M400 Tread 5.56 NATO, shown with a flash hider or suppressed, has an MSRP of $940. The Optic Ready Sig P320 X-Compact is chambered in 9mm and features a mounting plate for popular optics. 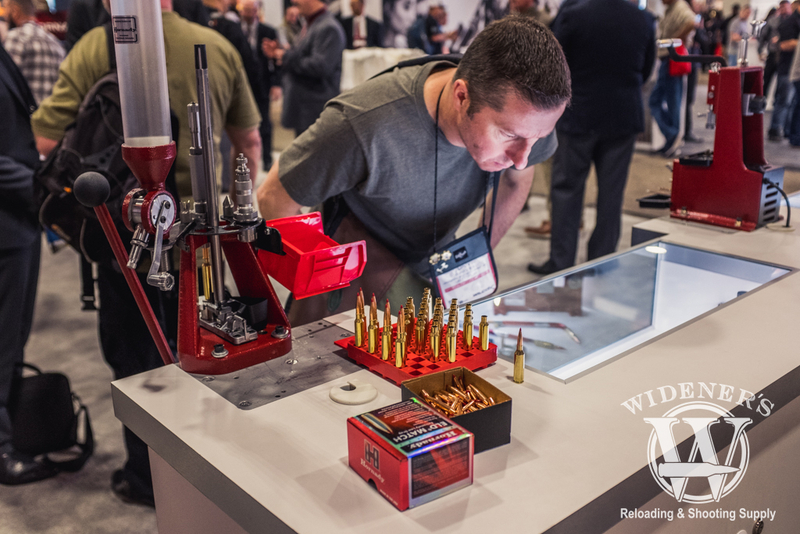 Hornady had their complete factory reloading setup inside of their booth at SHOT Show 2019. You could browse through a large variety of rifle caliber bullets, reloading supplies and get tips and expert advice on hand-loading from the Hornady crew. I spent quite a bit of time looking at a 7.62×51 NATO/.308 reloading set up they had on display, the build quality and features of their presses are top-notch. The Lock-N-Load Iron Press line features a bushing system that makes changeovers a breeze, it also comes standard with an automatic priming system, a patented shell holder platform and a cool accessory deck that keeps you organized as you are working through your reloads. The MSRP on the base model Iron Press is $229. A SHOT Show attendee looking at the Hornady reloading supplies on display. 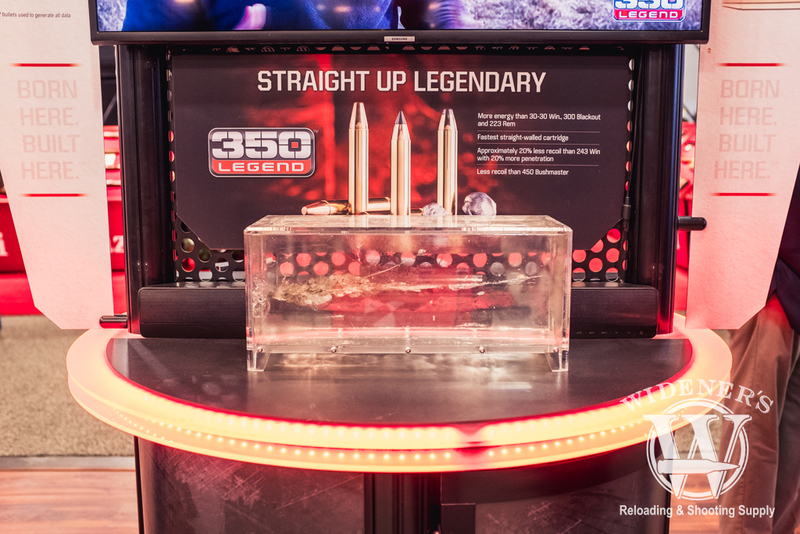 Hornady calls their new round, the ultimate 30 caliber, looking at the specs of the 300 PRC, it’s hard to argue with that tagline. The 300 PRC is a 225gr ELD Match round based on the 375 Ruger casing, it’s custom built around a precision magnum cartridge, with specs capable of delivering the highest levels of accuracy and aerodynamic performance. The Frontier line of 300 Blk was also on hand at the Hornady booth, this budget-friendly 125gr FMJ round is well-suited for a variety of purposes including firing with suppressed rifles. The Hornady 300 PRC Precision Hunter in 30 caliber and the Frontier line in 300 Blk on display. 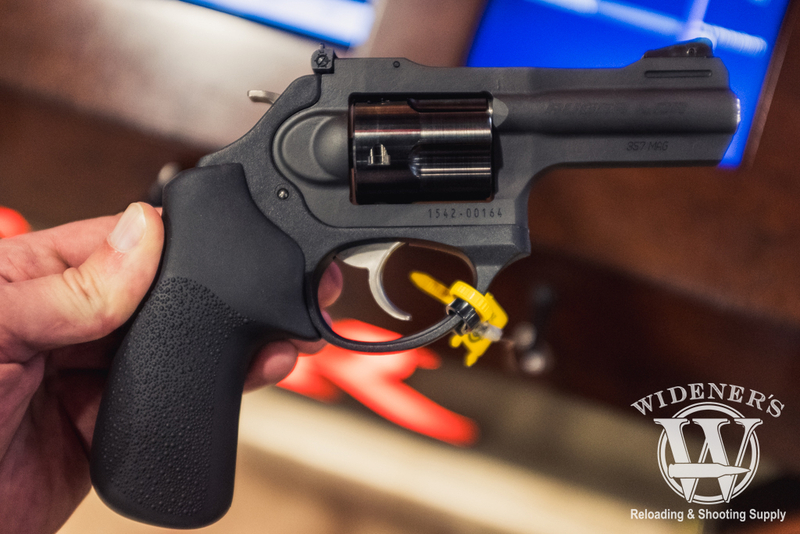 The Smith & Wesson booth at SHOT show 2019 was packed and for a good reason, S&W had one of the largest assortments of pistols, rifles and shooting accessories at the show. 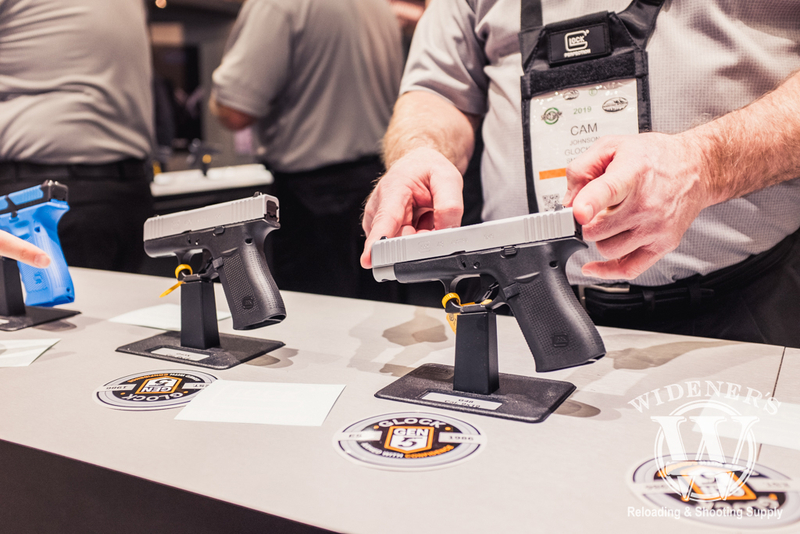 Attendees were able to browse and get hands-on with the full lineup of current S&W firearms, it was also easy to get expert recommendations, help, and advice from the S&W staff of experts who were easy to talk to. 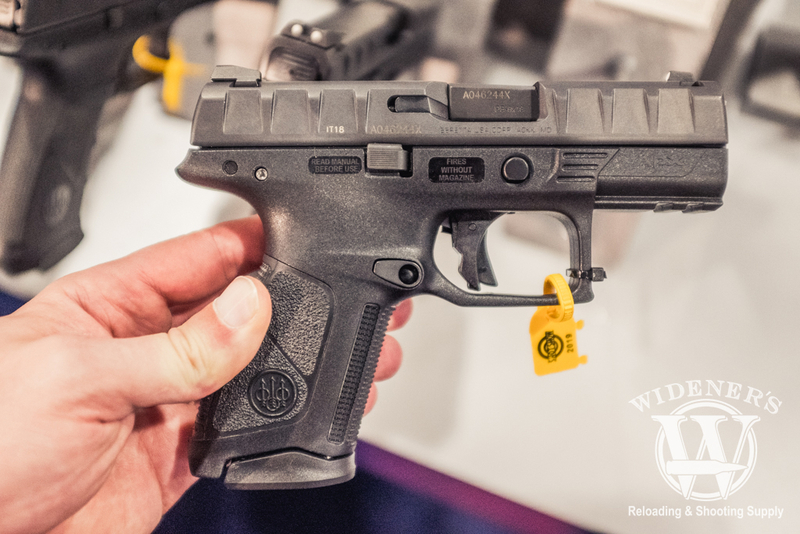 I hopped over to the revolver table to take a look at the new M&P Bodyguard .38 with integrated Crimson Trace red laser. This updated model is ready to handle 5 of the hot +P .38 Special loads and features a no-snag frame, ergonomic grip and a snub 1.875″ inch length barrel. The MSRP on the M&P Bodyguard .38 with CT laser is $539. The Smith & Wesson M&P Bodyguard CT in .38 Special includes a calibrated Crimson Trace red laser. A top view of the Smith & Wesson M&P Bodyguard CT in .38 Special with the laser mount. 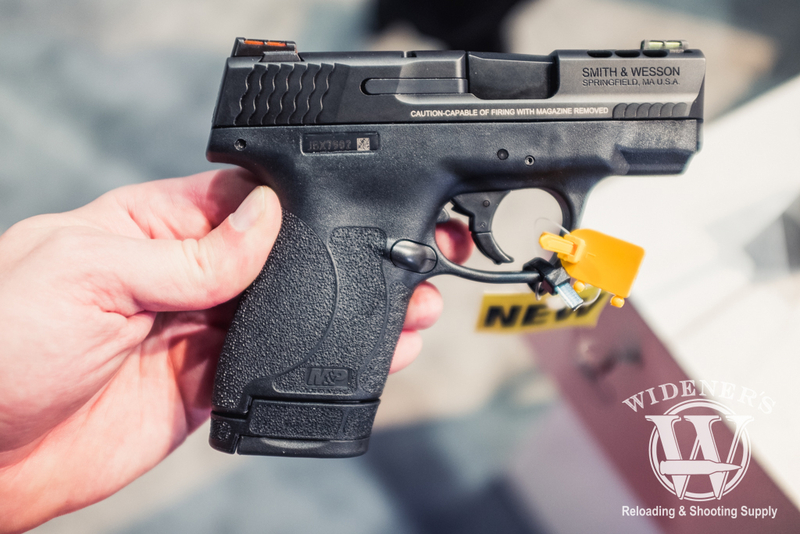 Smith & Wesson also had their full line of new M&P Shield Performance Center pistols on display. I was impressed with the build quality, features set, comfortable grip and very competitive pricing on these pistols. 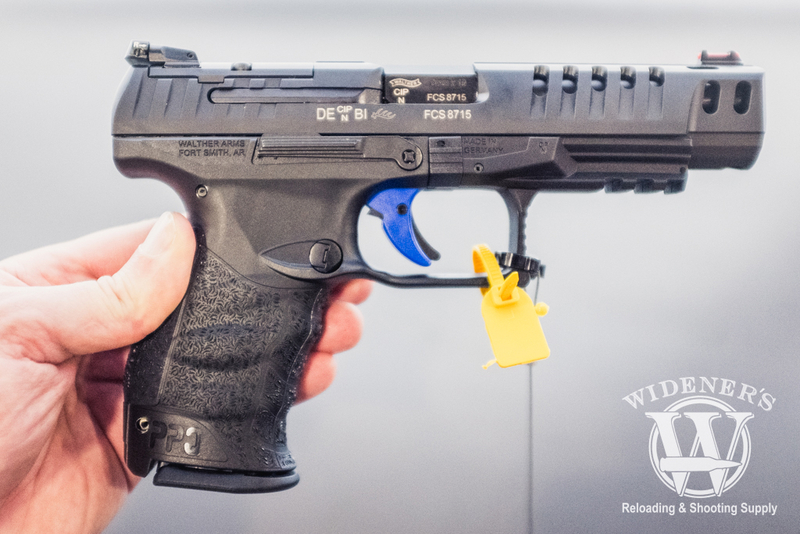 EachM&P Shield Performance Center handgun comes standard with professional grade features including a ported slide, fiber-optic sights, enhanced trigger, a barrel cleaning kit, and an extra magazine. The M&P 45 Shield Performance Center Pistol in 45 Auto has a 6+1 standard capacity and an MSRP of $539. The M&P 9 Shield Performance Center Pistol in 9mm has a 7+1 standard capacity and an MSRP of $539. 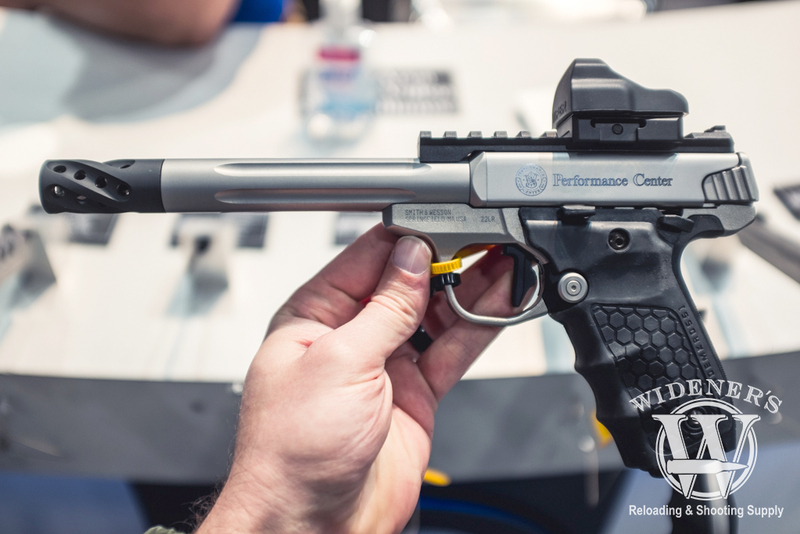 Also on hand at the S&W booth was the updated SW22 Victory line of Performance Center rimfire pistols. The Performance Center option comes with two 6-inch target barrel options, carbon fiber or fluted stainless-steel. Both pistols feature a custom muzzle break, Picatinny rail, Vortex Viper red dot, Tandemkross hive grips, target trigger, and extended mag release button. The SW22 Victory carbon fiber & fluted stainless-steel models have an MSRP of $868. 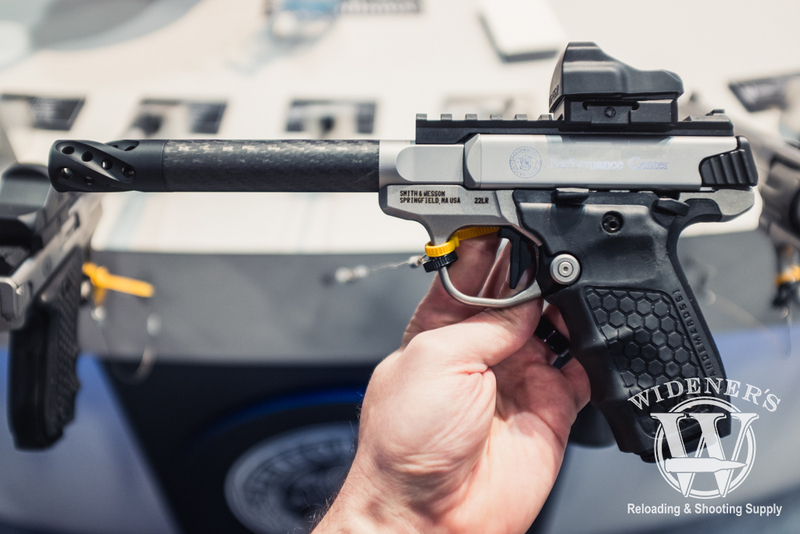 The Smith & Wesson SW22 Performance Center rimfire pistol with carbon fiber barrel option. Smith & Wesson SW22 Performance Center rimfire pistol with fluted stainless-steel barrel option. 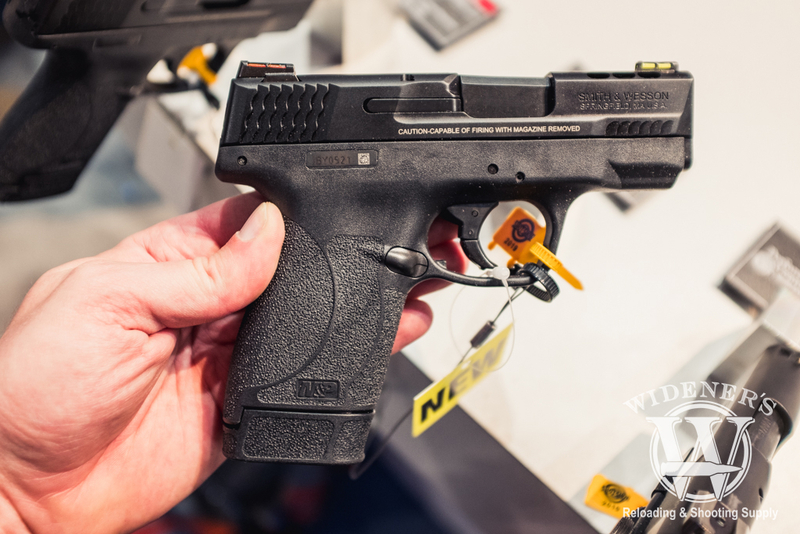 Beretta had their new APX Centurion 9mm pistol on display, I was impressed with the factory standard textured grip on this pistol, I was able to easily get a great purchase on it and it felt very good in the hand. The APX Centurion is a mid-sized smaller version of the standard APX pistol, it features aggressive slide serrations, a trigger that breaks at 6 lbs and a clear tactile and audible short reset. It has a 15+1 standard capacity and an MSRP of $575. 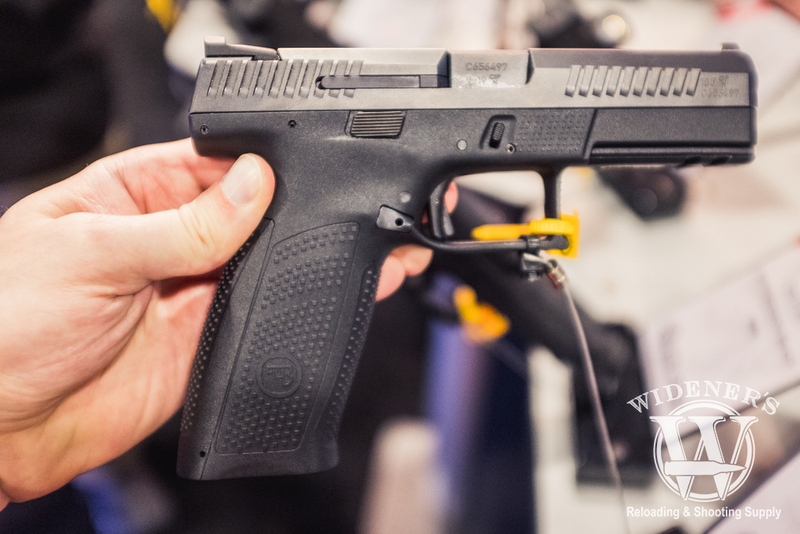 The new Beretta APX Centurion in a mid-sized 9mm pistol with a strong feature set at a competitive price point. 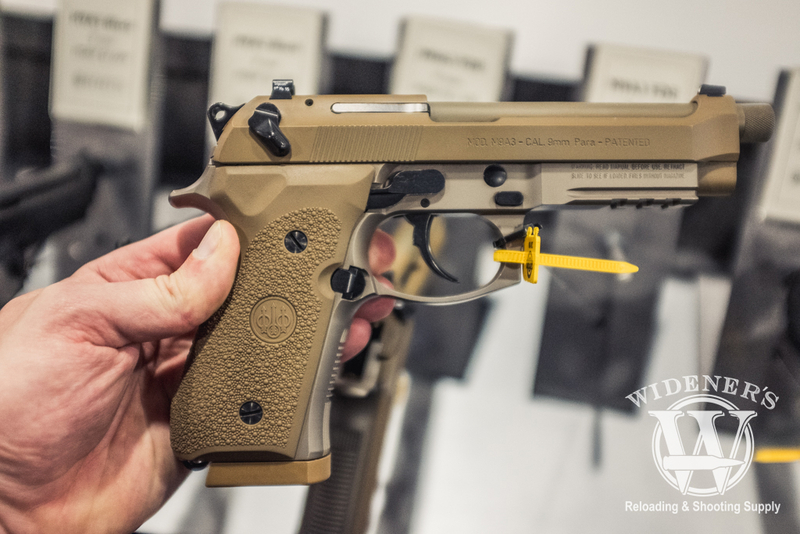 The Beretta M9A3 9mm in FDE was an eye-catcher on the SHOT show floor. This updated pistol features the famous 92 series cutaway slide and a compact profile for those carrying concealed. The thin textured grips on the M9A3 make it easy to get an excellent purchase on the body, it’s easily Beretta’s most refined combat pistol. It has a standard capacity of 17+1 and an MSRP of $1,100. The Beretta M9A3 9mm in FDE is a combat-ready pistol with professional features and a classic look. I couldn’t resist taking a look at the special Volunteer edition of the Beretta 92 Brigadier on display at the show. This special edition 9mm pistol features a custom engraved slide, special edition tri-star wooden grips and a whole lot of Tennessee pride! The MSRP on the Volunteer edition of the Beretta 92 Brigadier is $899. 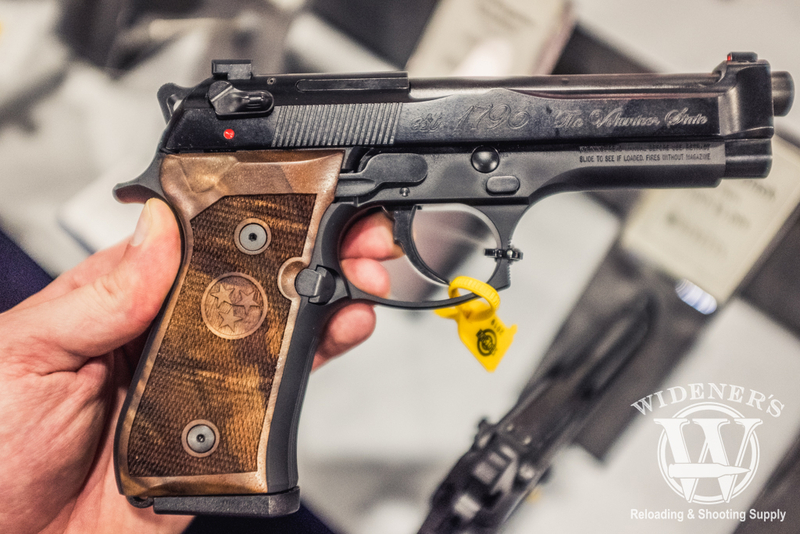 The Volunteer edition of the Beretta 92 Brigadier on display at SHOT show 2019. 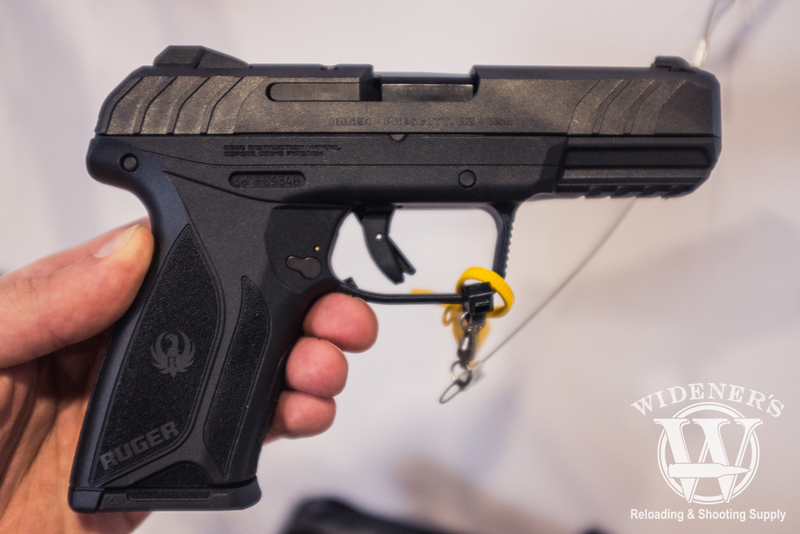 Ruger had their Security-9 pistol on prominent display in their booth, this glass-filled nylon framed handgun is a mid-sized compact pistol with a hardened alloy-steel slide and an aluminum chassis. I found the well-textured grip to be slim in hand, the slide was easy to rack and the sights were easy to acquire a target with. This entry-level pistol has an accessory rail, manual safety, a 15+1 standard capacity and an MSRP of $379. The Ruger Security-9 pistol is an entry-level priced handgun with several upgraded features. 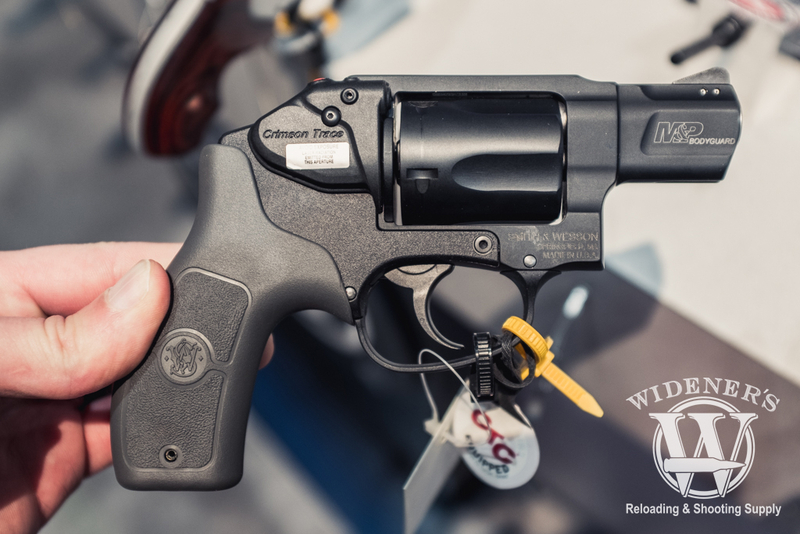 Ruger was also showing off the new LCRx .357 Magnum revolver, this 5-round capacity magnum gun includes an adjustable rear sight, Hogue molded grip and a fluted high-strength stainless steel cylinder with a PVD coating. The LCRx .357 Magnum has an MSRP of $669. The new LCRx .357 Magnum revolver is the latest 5-round capacity magnum pistol from Ruger. 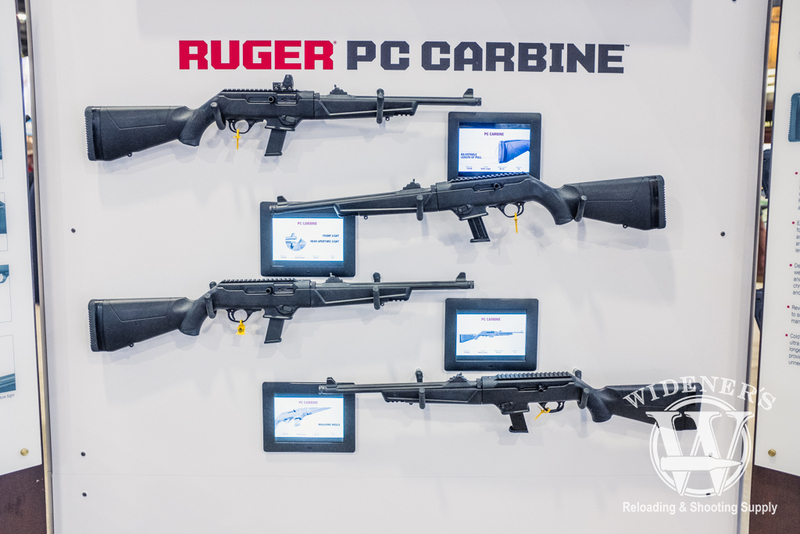 Ruger also had a display of their PC Carbine auto-loading rifle chambered in 9mm, the carbine has interchangeable mag wells to take common Ruger and Glock style magazines. The rifle has a cold hammer-forged, chrome-moly steel barrel with a CNC-milled 7075-T6 aluminum billet receiver. 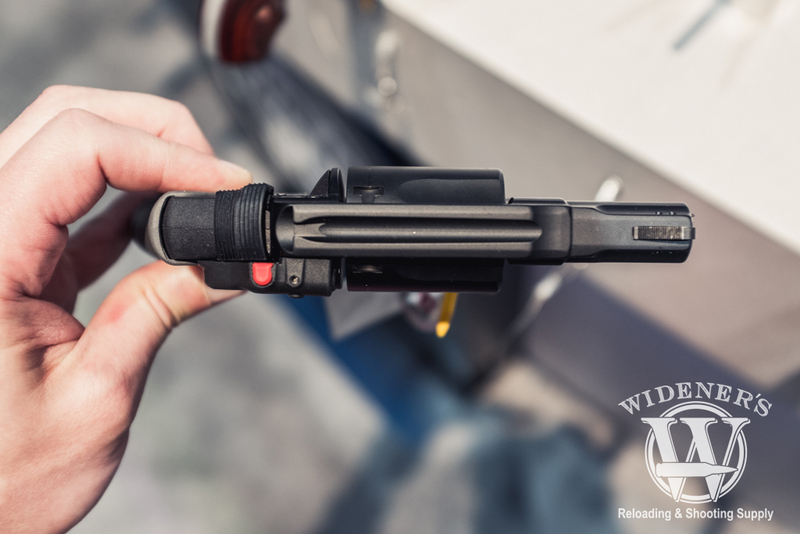 The trigger has a light-crisp trigger pull, positive reset, and is constructed from proven 10/22 rifle trigger components. The Ruger PC Carbine has an MSRP of $649. The Ruger PC Carbine is a rugged 9mm auto-loading rifle capable of taking popular Ruger and Glock style magazines. 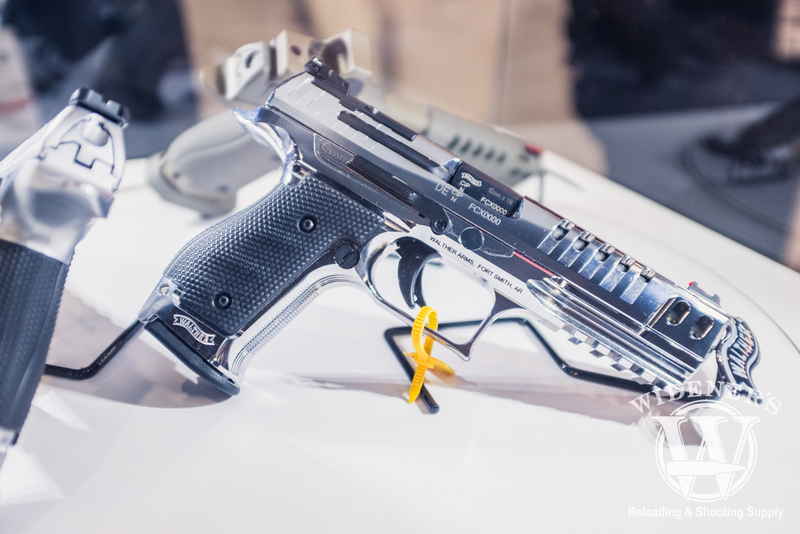 There was quite a bit of fanfare surrounding the announcement of the new steel frame Walther Q5 Match pistol, I have to say, it’s an impressive piece of engineering to see in person. The gun itself is rock-solid, with an ergonomic textured grip and optic ready mounting plates on the slide. The LPA iron sights on the new steel frame Q5 Match pistol are easy to sight with and the slide features serrations and a Tenifer coating that makes it easy to grip and rack. 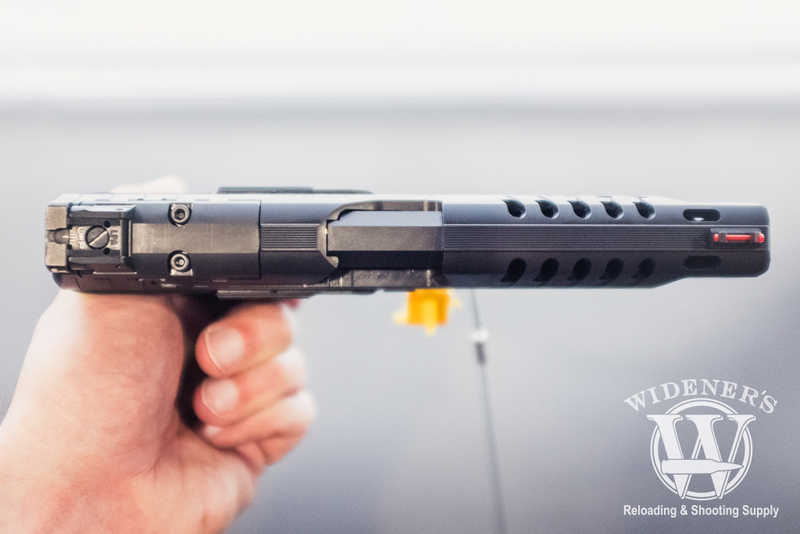 The gun features 2 drop safeties and a firing pin block safety, it has an enhanced 5.6 Lb trigger and ambidextrous slide stops and mag releases. This all-steel construction Walther is built with the competition shooter in mind, it has a 15+1 standard capacity, is chambered in 9mm and has an MSRP of $1,499. The new steel frame Walther Q5 Match pistol is a feature-rich pistol aimed at competition shooters. A top view of the new steel frame Walther Q5 Match pistol with serrated slide and LPA iron sights. Walther had several special editions of their steel frame Walther Q5 Match pistol, including this chrome version. 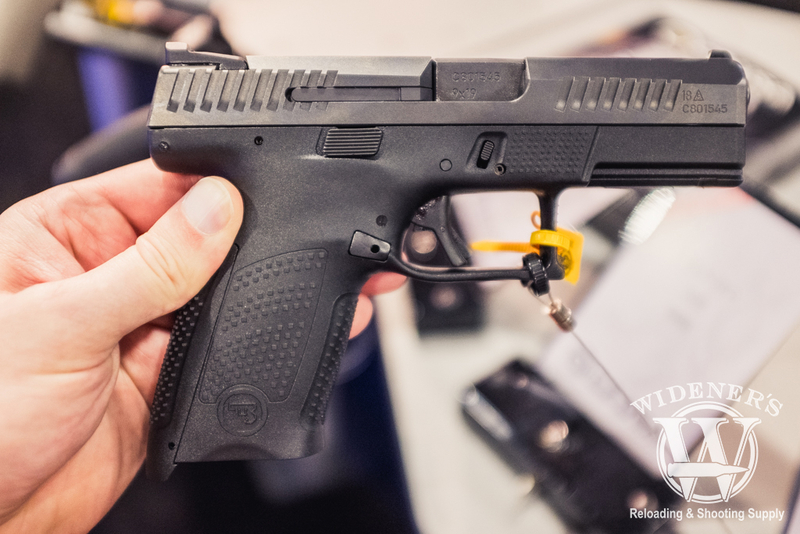 The CZ-USA booth at SHOT show 2019 featured a wide selection of pistols and pistol caliber carbines, both times I stopped in to look at new CZ products I had to stand in line. The CZ P-10 C pistol is a mid-sized striker-fired 9mm that features a front and rear serrated slide and a cold hammer forged barrel. The deep beavertail and interchangeable backstraps allow the P-10 to fit a wide variety of grip sizes. The CZ P-10 C has a 15+1 standard capacity and an MSRP of $499. The CZ P-10 C is the slightly smaller, lower standard capacity version of the popular P-10 series. The CZ-USA P-10 F is the 9mm full-sized high capacity version of the popular P-10 pistol line. 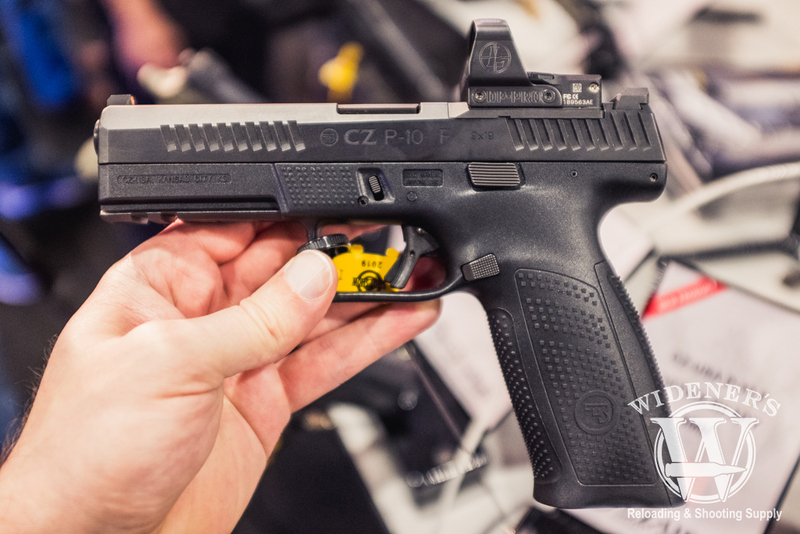 The CZ P-10 C has a 19+1 standard capacity and an MSRP of $524. The CZ-USA P-10 F has a standard capacity of 19+1 with the ability to increase the capacity to 21+1 with optional extended bases. There’s also an optic ready version of the CZ-USA P-10 F with mounting plates for popular pistol optics. 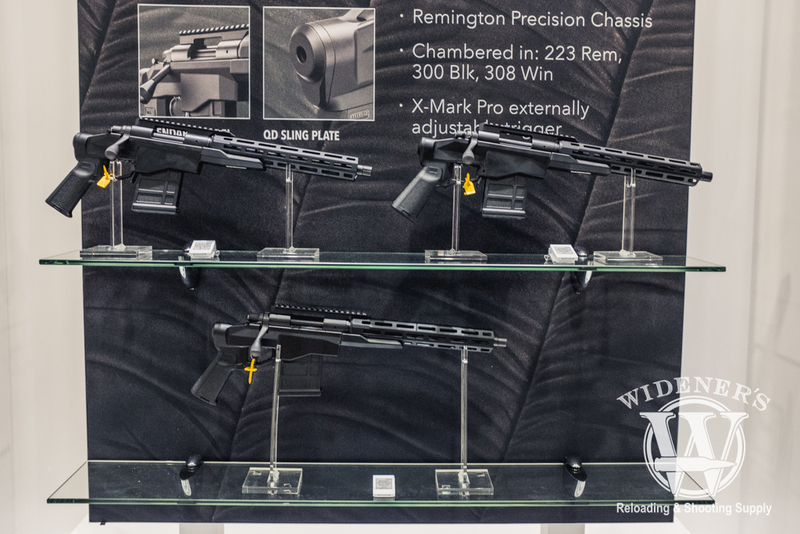 The Primary Arms booth was a popular destination at SHOT show 2019. 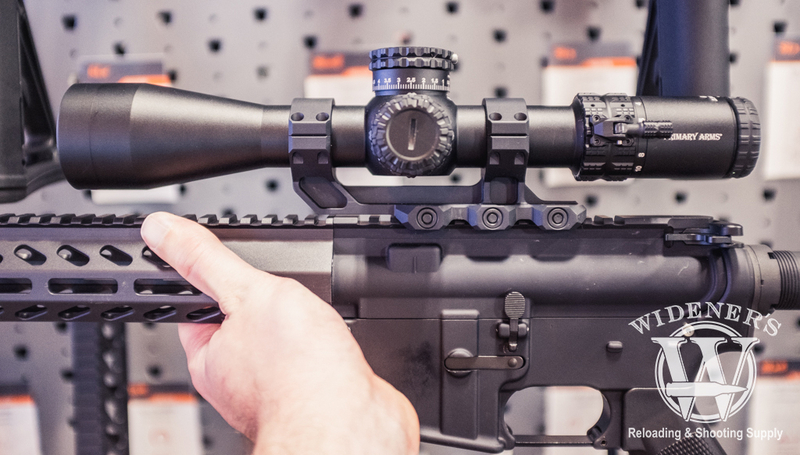 I got to take a hands-on look at the new GLx4 2.5-10×44 FFP Riflescope and I have to say, I walked away from the demo very impressed. The Primary Arms GLx4 2.5-10×44 is a First Focal Plane (FFP) scope that packs in a lot of pro-features at a very competitive price. 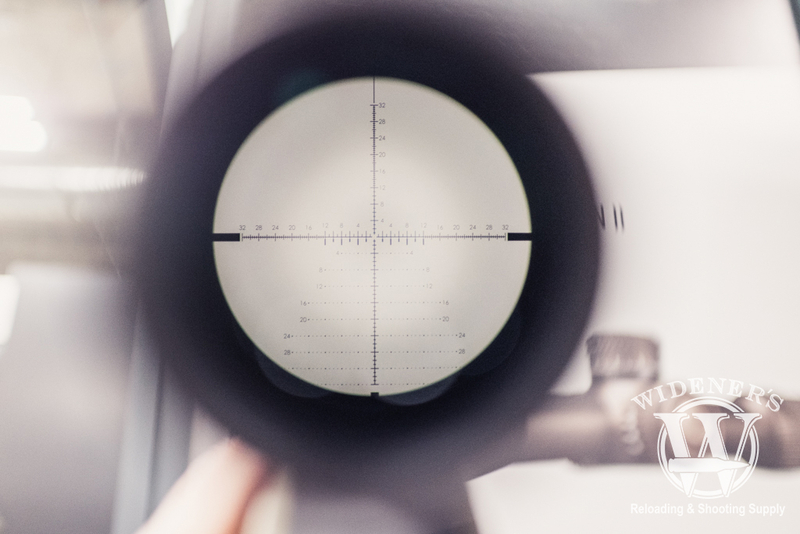 The optic glass used in the scope has excellent clarity, there is little to no vignette surrounding the sight picture, creating a clear, flat field of view for the user. The illuminated scope has AutoLive technology that detects movement and has an auto-shutoff feature to save battery life. MSRP on the Primary Arms GLx4 2.5-10×44 is $749-899 depending on the available reticle options. I enjoyed using the thumb lever to adjust the rear turret of the Primary Arms GLx4 2.5-10×44 scope. The fit and finish on the Primary Arms GLx4 2.5-10×44 scope is excellent, the laser engraved turrets give a satisfying “click” with each precise turn. 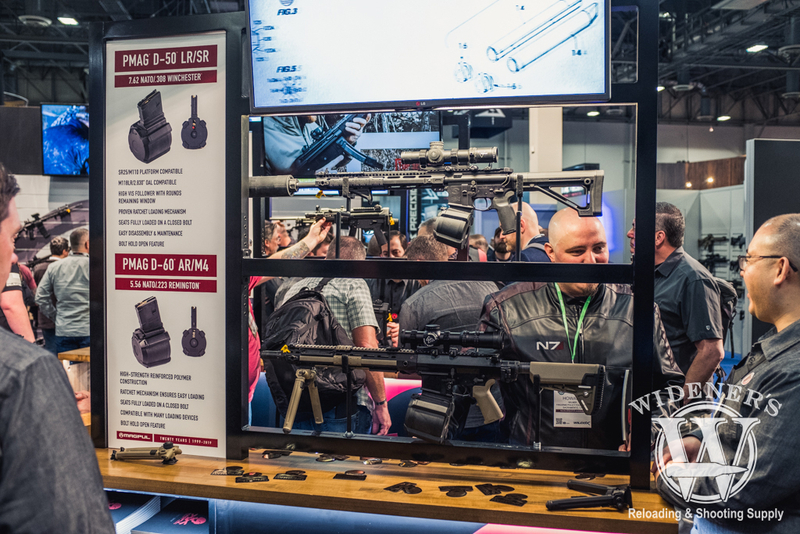 Vortex had an exciting booth presence at SHOT Show 2019 with plenty of optics, scopes, and accessories to try out. 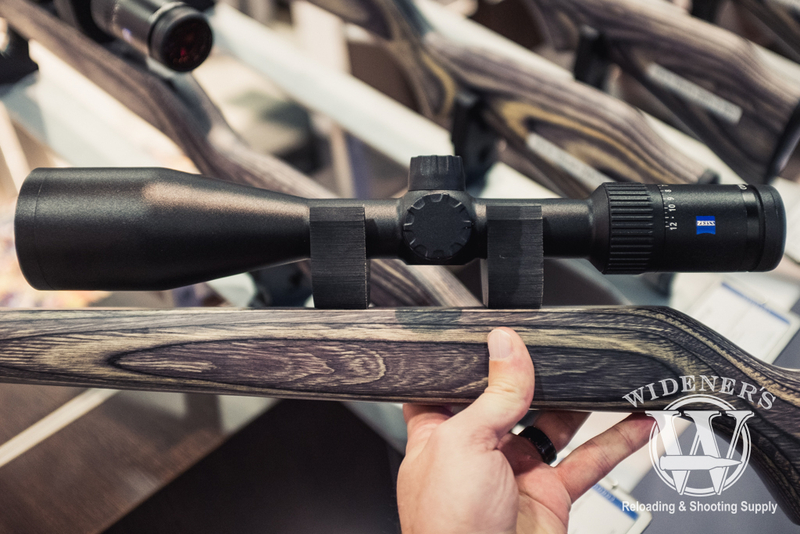 I took a look at the new RAZOR HD GEN II 4.5-27X56 RIFLESCOPE out on the display, it seemed to be one of the most popular models in the booth. The build quality of the scope is excellent, as were the clarity of the HD lens element optics and the machining on the turrets. 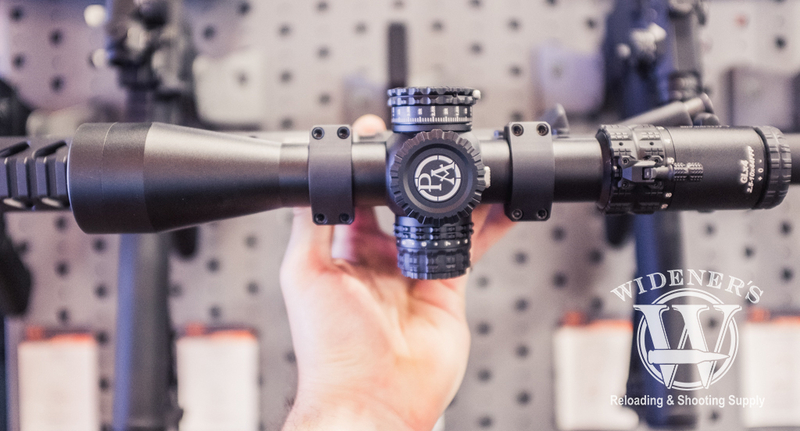 This 34mm-tube scope features a 6X zoom range, L-Tec turret system, and a VIP warranty. The RAZOR HD GEN II 4.5-27X56 model I looked at had an MSRP of $3399, but there are lesser priced models in the line available. 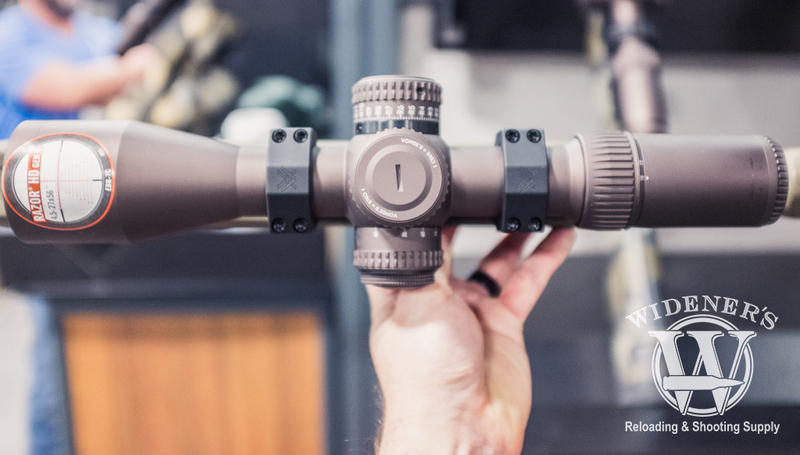 The new RAZOR HD GEN II 4.5-27X56 RIFLESCOPE at SHOT Show 2019. Top view of the new RAZOR HD GEN II 4.5-27X56 RIFLESCOPE at SHOT Show 2019. One of the several reticle options available for the RAZOR HD GEN II 4.5-27X56 RIFLESCOPE by Vortex. 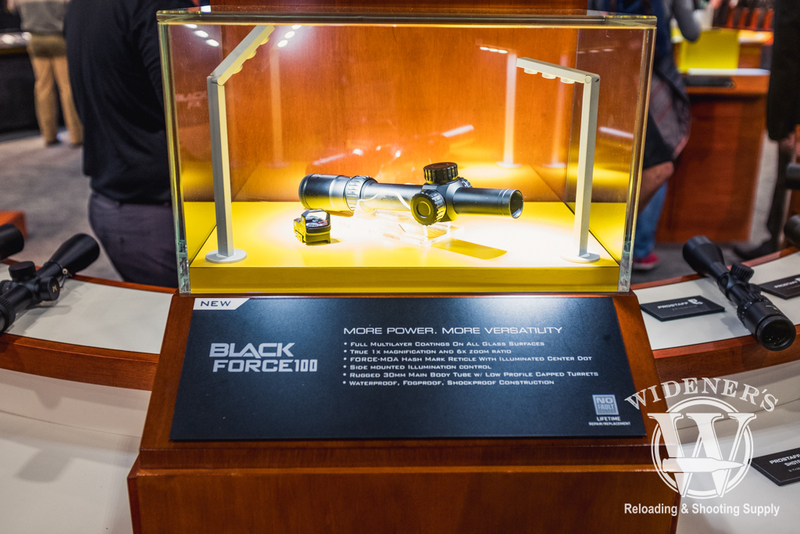 The folks over at Nikon had the all-new Black Force 100 1-6×24 scope displayed along with a Nikon P-Tactical SPUR red dot optic. The Black Force 100 1-6×24 is a 30mm-tube scope that is shock-proof, water-proof and is internally Argon purged for increased reliability against thermal shock and internal fogging. The scope features world-class Nikon optic glass, a quick-focus eye-piece, a 6X zoom ratio, a glass etched reticle, and a lifetime Nikon repair/replacement policy. The Black Force 100 1-6×24 scope has a TBA MSRP. The Nikon Black Force 100 1-6×24 scope features a glass etched reticle that maintains color and contrast in all lighting situations. 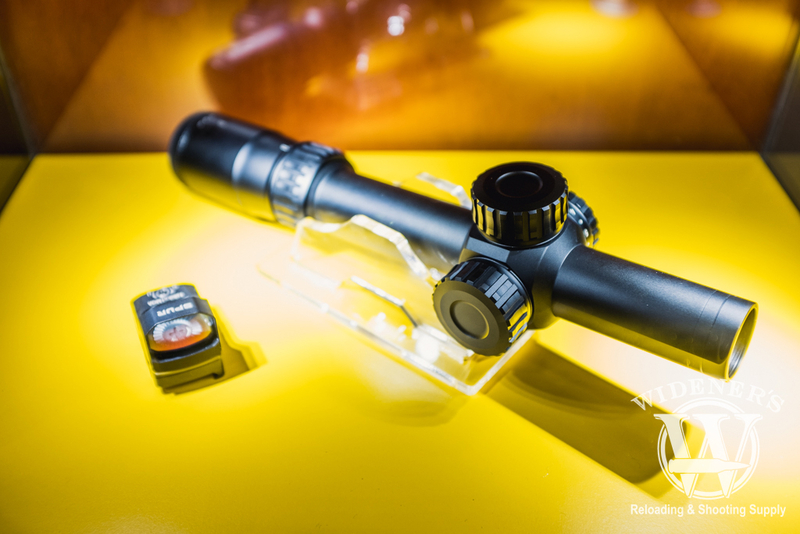 A detailed view of the new Nikon Black Force 100 1X 1-6×24 scope at SHOT Show 2019. 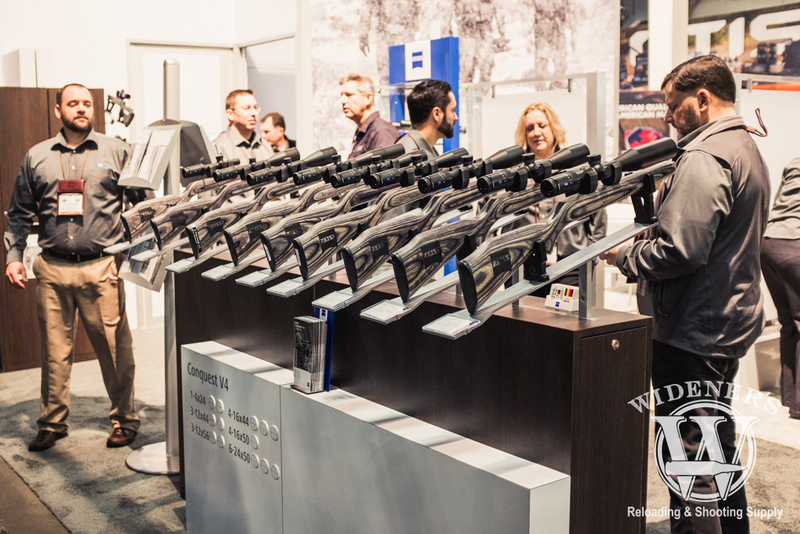 Zeiss Optics had a wide variety of scopes, rangefinders and binoculars on hand for SHOT show 2019. I had a good time looking through their line up of scopes and talking to their helpful show attendants. I spent most of my time looking at the Zeiss Conquest rifle scopes, I was impressed with the build quality and optics of the German-made scope line. The Zeiss Conquest V4 3-12×56 is a light-weight, high-performance rifle scope with a 30mm main tube and excellent light transmission. The well-machined turrets have a smooth .25 MOA click value with side parallax adjustment and capped windage and elevation turrets. The Conquest V4 3-12×56 has a 4X zoom ratio, an illuminated second focal plane cross-section reticle, six-layer lens T* multi-coating, and a limited lifetime transferable warranty and five-year no-fault policy. The Zeiss Conquest V4 3-12×56 scope has an MSRP of $899-1,025 depending on available options. The new Zeiss Conquest V4 3-12×56 rifle scope is designed for long-range hunters and sports shooters. 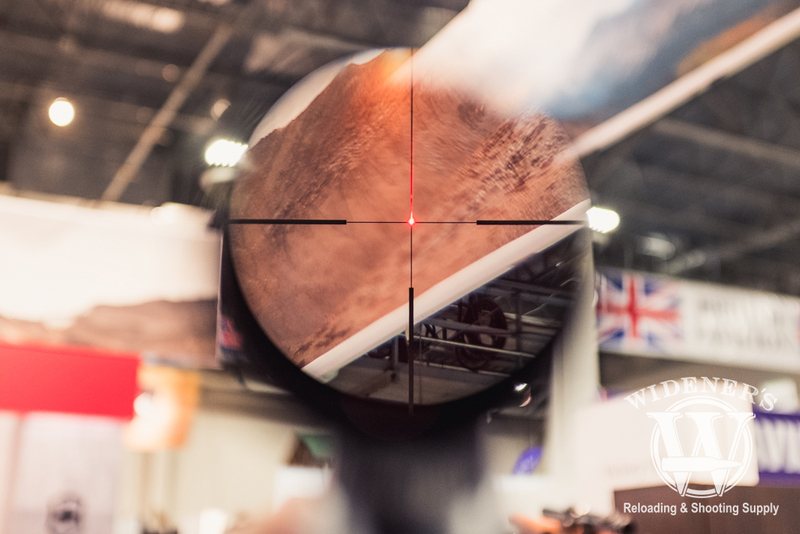 The illuminated Zeiss Plex reticle is easy to sight your target with, even in low lighting situations.